Top seed Rex Hedrick fell to The Man in Form Hari Pal Sandhu, who now lists 17 unbeaten matches, clinching his 4th title in a row! To be noted that Hedrix played three matches of 80m in a row!! Contrasting ladies final, with favorite Liu Tsz-Ling beating Kiwi Amanda Landers-Murphy in 32 minutes. Top seeds Rex Hedrick and Liu Tsz-Ling reached the finals in Melbourne with victories over compatriots, Hedrick beating Josh Larkin in a long four game match, Liu beating Ho Tze-Lok in straight games. 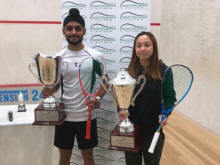 Both second seeds were beaten though, as New Zealand's Amanda Landers-Murphy and India's Harinderpal Sandhu beat Sarah Cardwell and Piedro Schweertman both in straight games. It was a good day for the seeds in Melbourne, as the top four won through to both sets of semi-finals. In the women's draw Australians featured in all four matches but only one survived. A Hong Kong finalist is guaranteed with Liu Tsz-Ling and Ho Tze-Lok set to contest one semi-final, while New Zealand's Amanda Landers-Murphy takes on second seeded Aussie Sarah Cardwell. In the men's draw top seed Rex Hedrick survived a five-setter with French junior Victor Crouin, and he'll meet Josh Larkin to provide an Aussie finalist. In the bottom half of the draw Piedro Schweertman meets in-form Indian Harinderpal Sanshu. All eight seeds made it through to the women's quarter-finals in Melbourne, the only one to drop a game was fourth seed Amanda Landers-Murphy who had to come from two games down to deny Australia's Christine Nunn, winner of last week's South Australian Open. Seven of the men's seeds came through to the last eight, the exception being young Frenchman Victor Crouin, who beat Korean Ko Youngjo to keep his good run of for going with the World Juniors approaching. The joint largest even in the Australian circuit, the Victorian Open was first played (as an amateur event) in 1931. 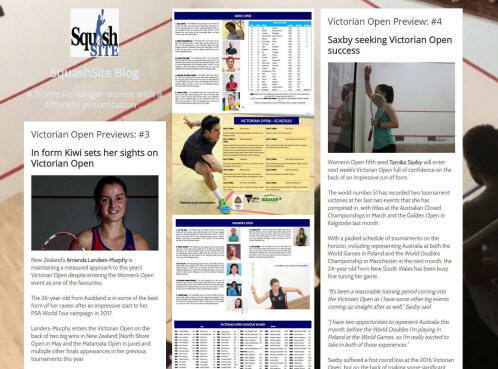 Since then, a veritable who's who of Victorian and Australian squash have won the title - Geoff Hunt (10 Times), Heather McKay (14 times), Chris Dittmar, Rodney Martin, Vicki Cardwell, Michelle Martin, Sarah Fitz-Gerald, David Palmer and the list goes on. This year's event features Men's and Women's $10k events, staged at Mulgrave Country Club in Melbourne.